Seattle-based launch coordinator Spaceflight is gearing up for its biggest operation yet: Smallsat Express, deploying a staggering 64 separate satellites from 34 different clients — all from a single Falcon 9 rocket. It’s quite an endeavor, but the company believes that this kind of jam-packed “space bus” is the best way to make satellite deployment cheap and easy — relatively speaking, anyway. That’s how founder Curt Blake explained it to me when I visited the company’s modest office in Westlake, a mile or so from downtown Seattle. Unfortunately, he said, they happened to make that investment just before another SpaceX rocket exploded on the launch pad. That rattled everyone, but ultimately the cost-benefit equation for wholesale rideshare like this makes too much sense. “There have been lots of shared launches before, but not on this scale,” he said. Dozens deployed, but not 64. The number was actually even higher originally, but some clients had to back out relatively late in the game. That’s one of the downsides of a major shared launch: an inflexible timeline. If 9 out of 10 of the passengers are ready to go, they can’t sit and wait while the last one gets their ducks in a row; the next favorable launch time might be months off. Spaceflight, like other launch coordinators, does a bunch of things for their clients: help navigate the red tape and schedule things, of course — but perhaps most importantly for a launch of this scale, it works with everyone to create a payload that can launch scores of satellites ranging in size from breadbox to cooler. That payload, Blake said, is known at SpaceX as the “FrankenStack.” A “stack” is the components in the rocket’s payload that actually do stuff, and Spaceflight had to make this one from scratch. They learned a lot, Blake noted, and had to invent a lot in order to cram all those satellites in there. The FrankenStack, which you can see at right, is rather like a giant wedding cake, with layers of different satellite deployment hardware. After all, these satellites are all going to different places, different orbits, different directions. You can’t just get up there and hit the “release” button. 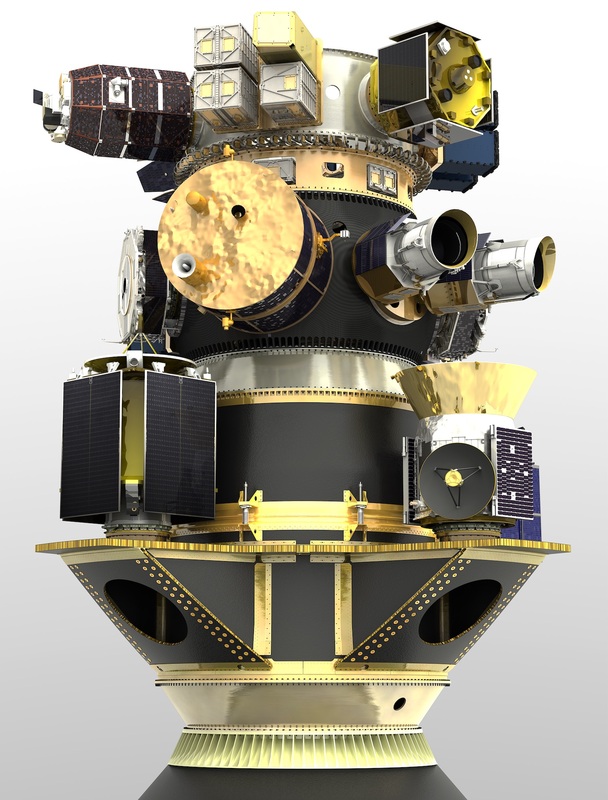 At the very bottom, or rather above the cone that attaches to the rocket stage, is the MPC, or multi-payload carrier, which has a variety of large items on four shelves, including ones that need to be launched along the FrankenStack’s path, as opposed to perpendicular. Above that is the hub and cubesat portion, also called the upper free flier, because it will detach from the MPC and go its own way. If all goes well, there will be 64 more little stars in the sky by the end of tomorrow. Watch the live stream of the launch on SpaceX’s site starting at about 10 AM.